1906: Launched by Hall, Russell & Co Ltd, Aberdeen (Yd.No.146) for The Balgownie Steam Trawl Fishing Co Ltd, Aberdeen as BELMEDIE. 29.12.1906: Registered at Aberdeen (A113). Andrew Lewis designated manager. By 1912: Believed fishing out of/landing into Fleetwood. 3.09.1912: In heavy weather and SW strong gale, between The Smalls and Bardsey Island, sighted drifting Admiralty caisson which had broken away from tug MILEWATER (320grt/1888) about 20 miles NNE of The Smalls while on delivery voyage from the yard of Workman, Clark & Co Ltd, Belfast to Portsmouth. Closed and with great difficulty Sk. Andrew Smith managed manoeuvre tand get a line onboard to hold the caisson. 4.9.1912: At about 3.00am. the two man runner crew, exhausted by their experience, requested to be taken off the caisson and a boat transfer was effected with two members of the trawler crew replacing them (one named Riley). Steam trawler WRENTHORPE (FD80) came on the scene and also got a line onboard and tow was commenced for Holyhead with HM cruiser BRISTOL escorting. 5.9.1912: Tow parted but reconnected. 7.9.1912: Arrived off Holyhead, transferred to tug MILEWATER and placed safely on the Government Buoy in the West Refuge Harbour. 14.11.1912: Salvage awards were made in the Admiralty Court in respect of services rendered to the Admiralty caisson in September. The caisson cost £16,000 to build. BALMEDIE was awarded £600 with a further £45 for the three men who rendered boat services. WRENTHORPE was awarded £530. 8.1914: requisitioned for war service as a minesweeper (Ad.No.350). Dardanelles campaign (Sk. George Reynolds RNR). 27.4.1915: During progress of the battle off Anzio Beach, berthed alongside at stern of hired Glasgow registered steamer IONIAN (8268grt/1901) which was light ship. IONIAN turned propeller which cut into shell plating causing her to fill and sink alongside. All crew saved. 22.12.1915: Aberdeen registry closed “Ship lost at Dardanelles, April 1915”. This entry was posted in Non Fleetwood Vessels, Seasonal Visitors, Steam Trawlers, War Losses on August 18, 2018 by Fred Smith. 13.10.1904: Launched by Cook, Welton & Gemmell Ltd, Beverley (Yd.No.61) for Alick L. Black, Grimsby as COURTLAND. 2.12.1904: Registered at Grimsby (Part I & IV) O.N.118938 (GY35). 12.1904: Completed. Alick Black designated managing owner. 6.1908: Sold to Stoomvisscherij Mij Grotius, IJmuiden (A. G. Meeuwenoord Jnr, Velsen/IJmuiden & Alick L. Black) through Maatschappij tot Beheer van Steamtrawlers en Andere Vaartuigen. 23.6.1908: Registered at IJmuiden as GROTIUS (IJM14). A. G. Meeuwenoord Jnr & A. de Vries designated managers. 9.2.1909: IJmuiden registration withdrawn by Lord Mayor of Velsen on legal grounds; owners informed but did not agree. 10.1909: Sold to Christian M. Evensen, Hull. At Fleetwood completed Special survey and registered at Thorshavn, Faroe Islands as PAULINE (TO??). J. P. Evensen, Thorshavn designated manager. Fishing out of Fleetwood. 3.1915: Sold to Earl Steam Fishing Co Ltd, Grimsby. 12.3.1915: Registered at Grimsby as EARL GRANARD (GY449). 4.1915: Requisitioned for war service as a minesweeper (1-6pdr HA) (Ad.No.2653). 24.9.1915: Sold to Rushworth Steam Fishing Co Ltd, Grimsby. 16.3.1918: Sold to Isaac Bunch, Grimsby. By 12.3.1919: Returned to owner. 22.12.1923: Sold to The Great Central Co-Operative Engineering & Ship Repairing Co Ltd, Grimsby. 15.6.1928: Sold to Harold Bacon, Grimsby. 26.9.1930: Sold to T. C. & F. Moss Ltd, Grimsby. 1.4.1931: Registered at Grimsby as CASTLETON (GY449). 30.11.1939: Requisitioned for war service as a minesweeper but employed on auxiliary patrol (Hire rate £52.15.0d/month). 6.1940: On a trip (Sk. Walter Sibley); ten crew all told. 26.6.1940: At 9.30am. when east of Orkney, attacked by German Do17Z aircraft, bombed, badly damaged and foundered. All ten crewmen lost. 22.10.1940: Grimsby registry closed ‘Vessel missing since 28/6/40’. Lost – Sk. Walter Sibley (43); John Allen Webb (45), Mate; Thomas George Hubbard (50), Third Hand; William Stewart (53), Ch Eng; George Henry Cook (56), 2nd Eng: Charles James Dillon (45), John Dennis Ryan (40), John Thomas Squire (37), Deckhands; Leslie Albert Osborne (19), Trimmer; Alexander Campbell McLintock White (64) Cook. 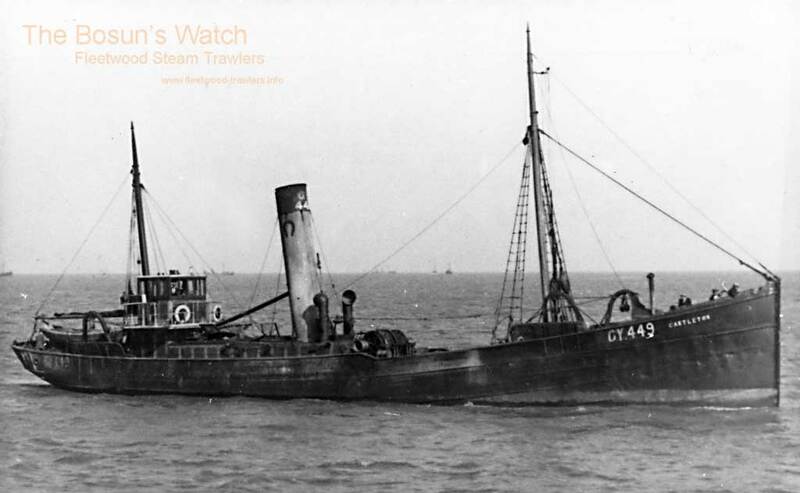 This entry was posted in Lost Vessels, Steam Trawlers, Steamers (Picture), War Losses on March 5, 2018 by Fred Smith. 16.10.1905: Launched by Smith’s Dock Co Ltd, North Shields (Yd.No.784) for J. E. Rushworth & R. Atkinson, Grimsby as TUBAL CAIN. 21.11.1905: Registered at Grimsby (GY88). J. E. Rushworth designated managing owner. Fishing out of Fleetwood. 8.1914: On an trip to Iceland grounds (Sk. William Charles Smith). 7.8.1914: When some 50 miles WNW of Stalberg, west coast of Iceland, stopped by armed German liner KAISER WILHELM DER GROSSE (Kapitän Max Reymann, 14349grt/1897). Crew taken prisoner and sunk by gunfire. 09.08.1914: Grimsby registry closed “Sunk by German cruiser”. 26.8.1914: Coaling and re-provisioning at Rio de Oro, Spanish Sahara, west Africa when the cruiser HMS HIGHFLIER (Capt Henry Buller RN) arrived off the bay. Skipper and crew put aboard the collier ARUCAS (2317grt/1914) which sailed for Las Palmas. Following a brief engagement, KAISER WILHELM DER GROSSE was scuttled by her crew and HIGHFLIER, conscious of having breached Spanish neutrality, left the area. 28.8.1914: Arrived Las Palmas, crew put ashore, contacted owners. This entry was posted in Lost Vessels, Steam Trawlers, War Losses on March 2, 2018 by Fred Smith. 1902: Launched by George Cooper, Hull (Yd.No.8) for George F. Sleight, Grimsby as REGO. 2.2.1903: Registered at Grimsby Part IV (GY1239). George F. Sleight designated managing owner. 12.2.1903: Registered at Grimsby Part I – O.N.113239. Pre 1914: Fishing out of Fleetwood. 28.9.1914: At Fleetwood, landed an old mine casing trawled up off the Firth of Clyde. 23.9.1916: On a North Sea trip. When some 40 miles SEbyE of Spurn Light vessel stopped by U-boat (UC16). Crew abandoned in boat and sunk by gunfire. 18.10.1916: Grimsby registry closed “Sunk by a submarine”. This entry was posted in Lost Vessels, Steam Trawlers, War Losses on December 12, 2017 by Fred Smith. 13.3.1897: Launched by Mackie & Thomson Ltd, Govan (Yd.No.142) for Hagerup, Doughty & Co Ltd, Grimsby as WALTHAM. 11.5.1897: Registered at Grimsby (GY303). Frederick Emil Hagerup appointed manager. 4.1906: Sold to Consolidated Steam Fishing & Ice Co (Grimsby) Ltd, Grimsby. John Denton Marsden appointed manager. Fishing out of Fleetwood. 30.5.1910: Arrested for suspected illegal trawling off north coast of Co. Mayo. 12.7.1910: At Ballina, Co. Mayo, Petty Sessions, The Dept of Agriculture in Ireland brought charges against the skipper of illegal trawling. The magistrates did not accept the defence that the trawler was sheltering and imposed a fine of £100 with £28 cost. 1.1.1914: Tonnage altered to 63 net under provision of Merchant Shipping Act 1907. 12.1914: Requisitioned for war services as a minesweeper (1-12pdr) (Ad.No.689). 10.12.1914: Arrived Larne as part of Unit 69. 28.1. 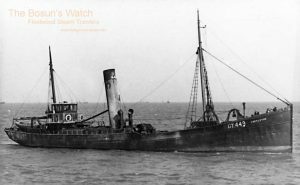 – 13.2.1915: Detached to Morecambe Bay with minesweeping trawlers CERESIA (Ad.No.194) (FD26) and ROSE II ((Ad.No.592)(GY312). 28.5. – 8.6.1915: At Belfast, refit and repairs. Ty/Sk. Alfred C. Cable RNR appointed CO.
9.8.- 18.8.1916: At Dublin, refit and repairs. 6.2. – 16.2.1917: At Dublin, refit and repairs. 3.1917: At Larne fitting out as decoy vessel. 4.7. – 13.7.1917: At Dublin, repairs. Ty/Sk. James Mair RNR appointed CO. Possibly operating as a ‘Q’ ship. 10.10.1917: Missing off the Isle of Man. May have been mined by mines laid on 4.10.1917 by U.boat (UC75). (Loss is not recorded in ADM137). 16.4.1919: Grimsby registry closed “Vessel lost”. Lost: Ty/Sk. James Mair RNR; William Webster, 2nd Hand; Robert Strachan, Engineman; Campbell Duncan, Michael Holland, Edmund Richardson, Peter S. Stephen, James Stewart, David Wilson, deckhands; Charles F. Fewster, Robert W. Marsh, John Smith, William Tolan, trimmers. This entry was posted in Lost Vessels, Steam Trawlers, War Losses on August 8, 2016 by Fred Smith.